UPDATED: Originally posted on July 1, 2014. We love this holiday and all of it’s glitter in the sky glory! But what do we love more than fireworks, backyard bbqs and pool parties? Treats! 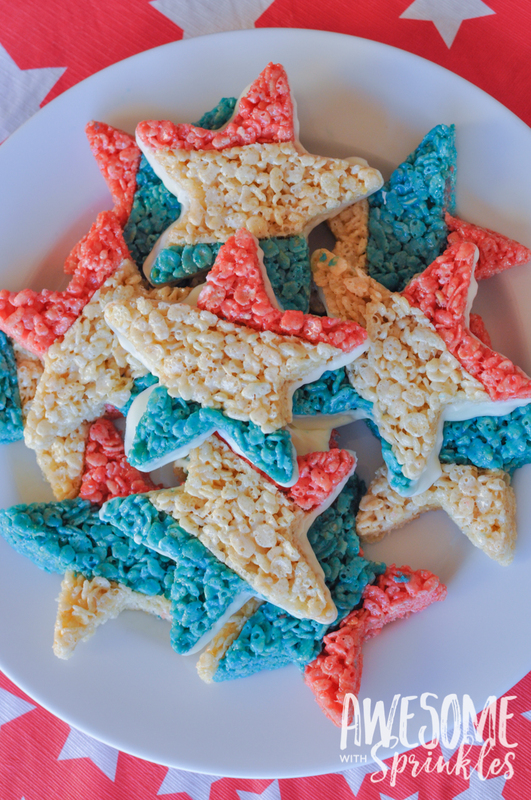 That’s right, we love ourselves some crispy rice treats! 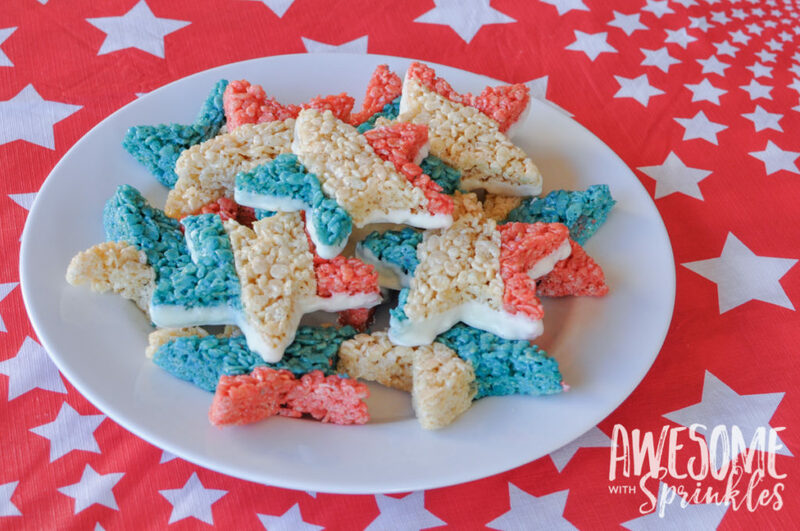 We’ve taken our favorite recipe and added a fun, colorful twist! 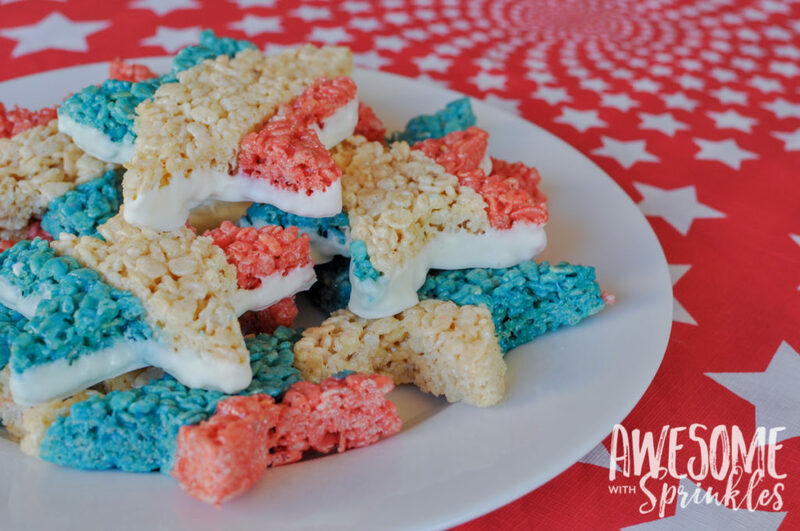 Crispy rice treats are super easy to make to begin with and with just a few extra steps you can take them to the next level! 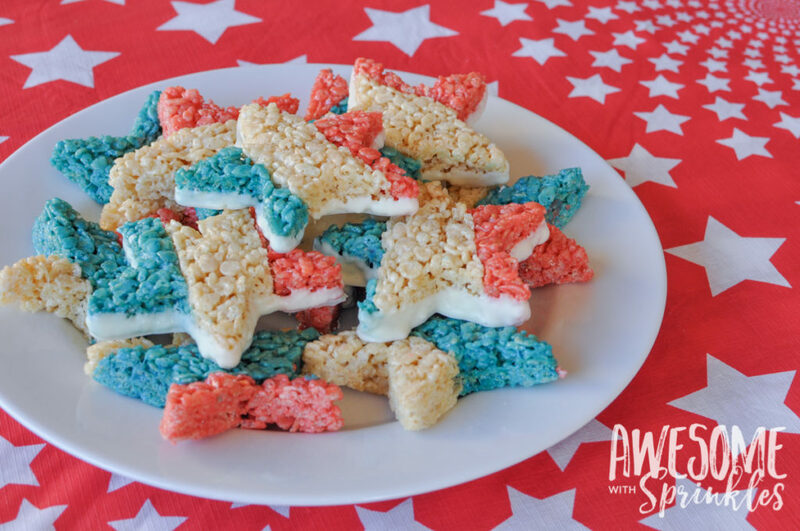 These adorably festive little treats will be the stars of your next patriotic picnic! 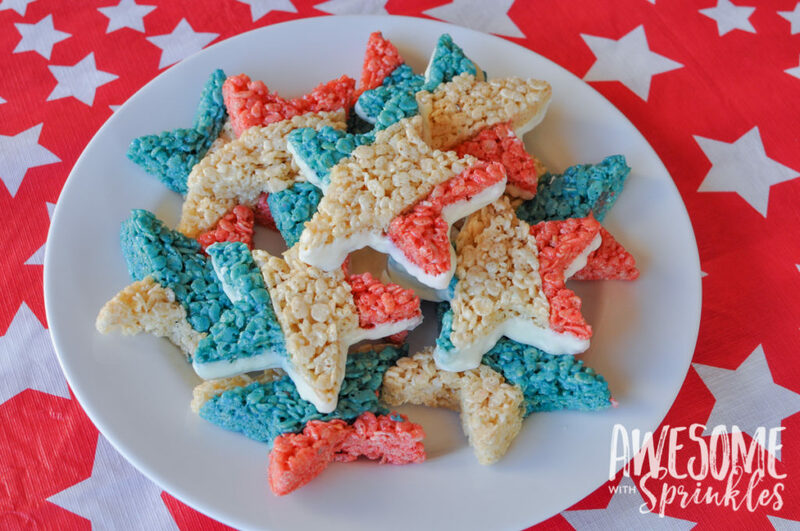 These tricolor star crispies are really easy to make. You do need to work quickly so that they marshmallows remain pliable enough to work with, but since you are basically making 3 mini batches, it goes pretty quickly. 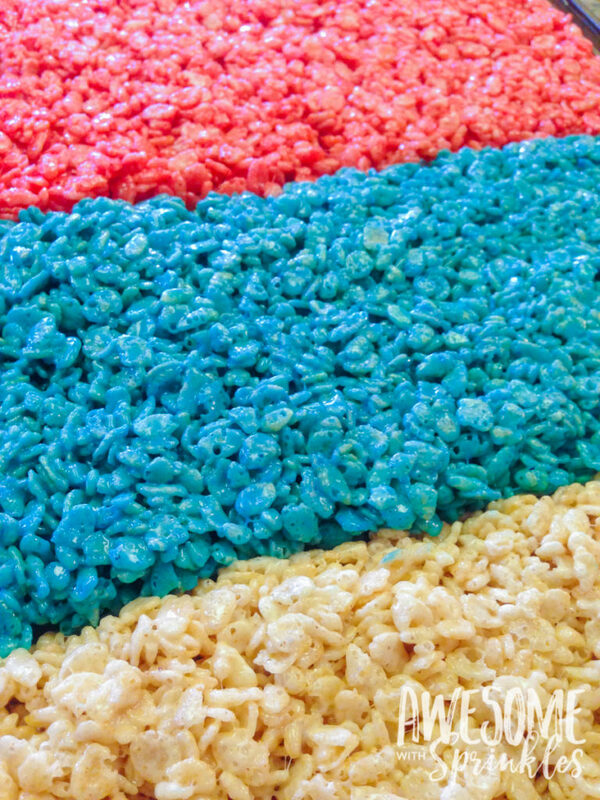 Start by making each colored batch of crispies and smooshing them together in a pan. You want these layers to be nice and thick! Cut each layer into about 1 1/2 inch strips. 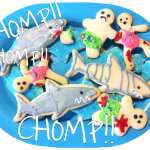 You may need to adjust the size depending on how large a cookie cutter you are using. Just measure the width of your cookie cutter at the widest point and divide by 3. We were using a 4 1/2 in cookie cutter so 1 1/2 was perfect. Arrange them into your desired pattern and smoosh together. 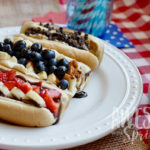 We’ve taken our favorite recipe and added a fun, colorful twist! 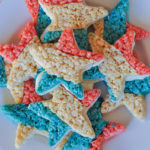 These adorably festive little treats will be the stars of your next patriotic picnic! Grease or coat a 9 x 13” glass or non-stick baking pan. You will use this pan for all three colors. 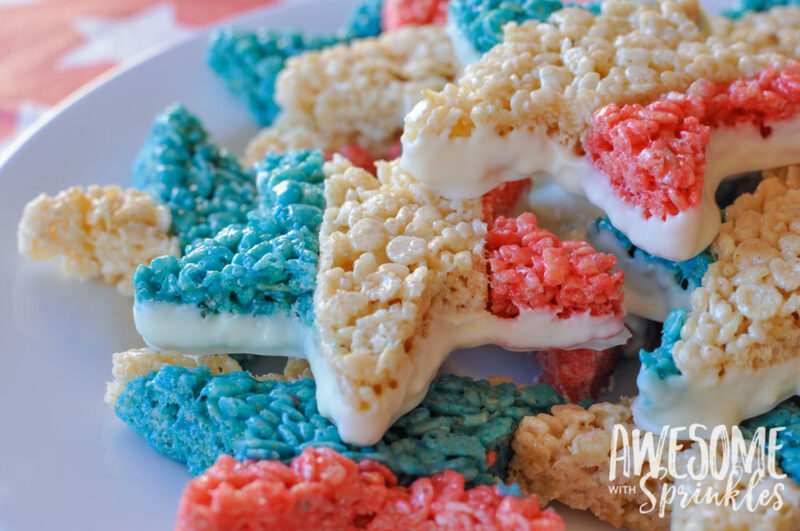 We are going to make these crispies 3 times (one for each color). To start, measure out 2 cups of cereal and toss with 1/4 tsp sea salt. To brown the butter, melt 3 tbsp of butter, (slice into pats for easy melting) cooking pot over medium-low heat. Stir frequently and keep a watchful eye as you wait for the butter to turn an amber color and smell toasty. Be careful – once it starts to brown it can burn quickly in a matter of seconds! Once the butter browns, turn off the heat and stir in 1 1/4 cups mini marshmallows and food coloring (amount will vary depending on your desired color). Repeatedly fold the marshmallows in with the hot butter using a silicone spatula until they melt into a smooth and uniform elastic mass. 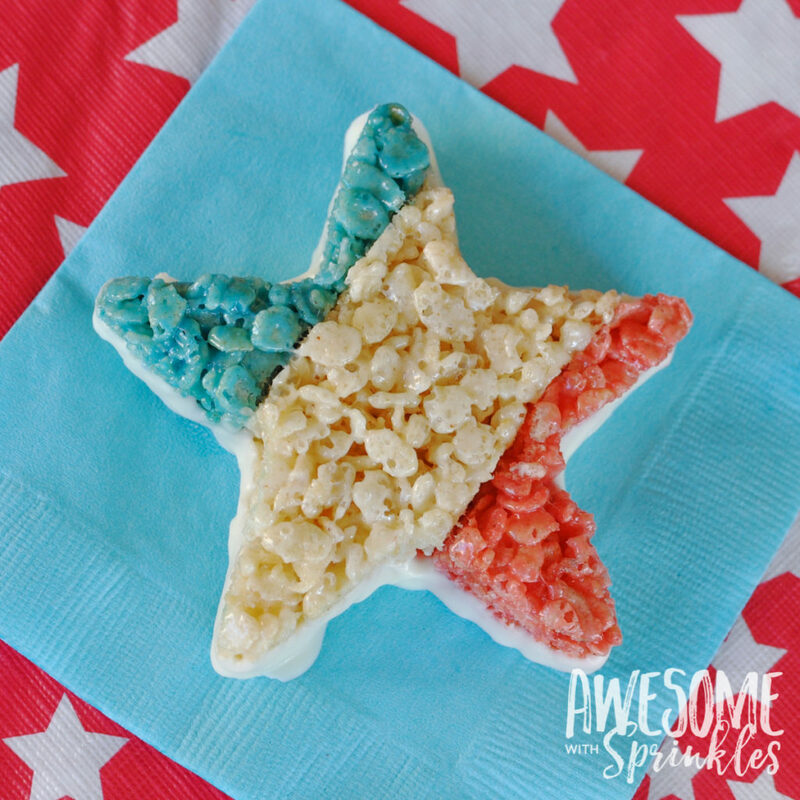 Pour 2 cups of the rice cereal and sea salt mix into the pot with the melted marshmallows and fold together gently until combined. While still warm and pliable spread into ⅓ of the greased pan, pressing down with the side of a rubber spatula to make even and smooth. You want a nice thick layer of crispie (about 1 inch high). Repeat for the next two colors (omitting the food coloring from the white batch). Smoosh them right in next to the other colors. 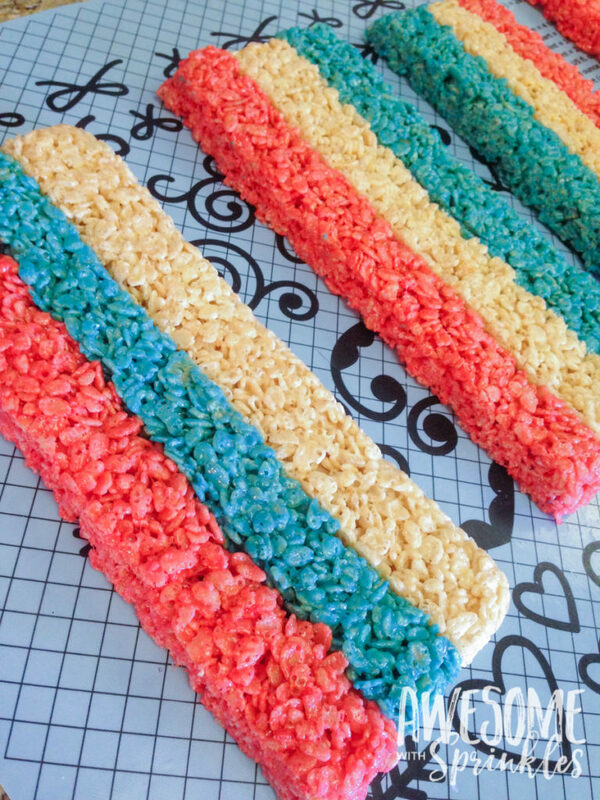 You will need to work quickly while the crispies are not completely cool and are still sticky. After all of the crispies are in the pan and still semi sticky, flip them out onto a cutting mat. 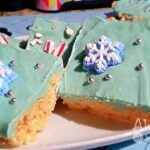 Cut each layer of crispies into strips about 1 1/2 inch wide (this may vary depending on the width of your cookie cutter. Ours was about 4 1/2 inches wide). Arrange the strips in alternating colors. 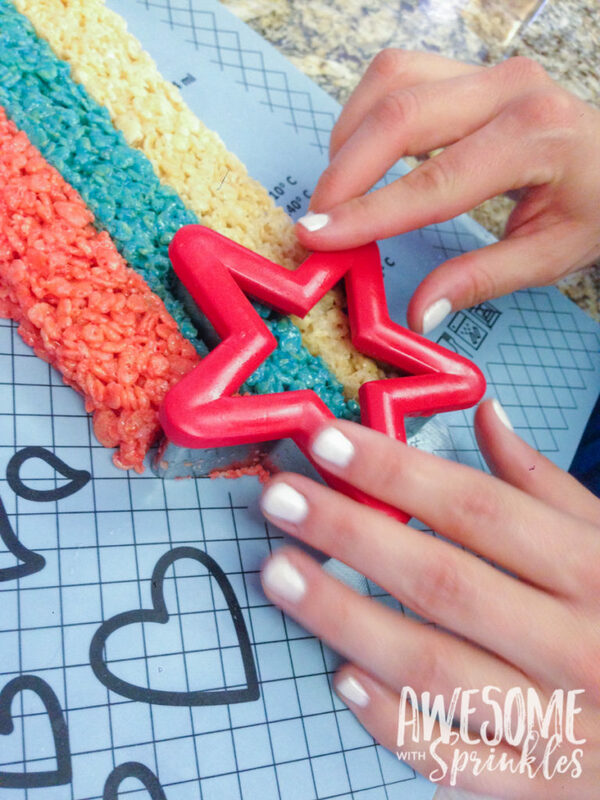 Smooth them together a little bit so that they stick together and hold their shape creating a wide striped section. 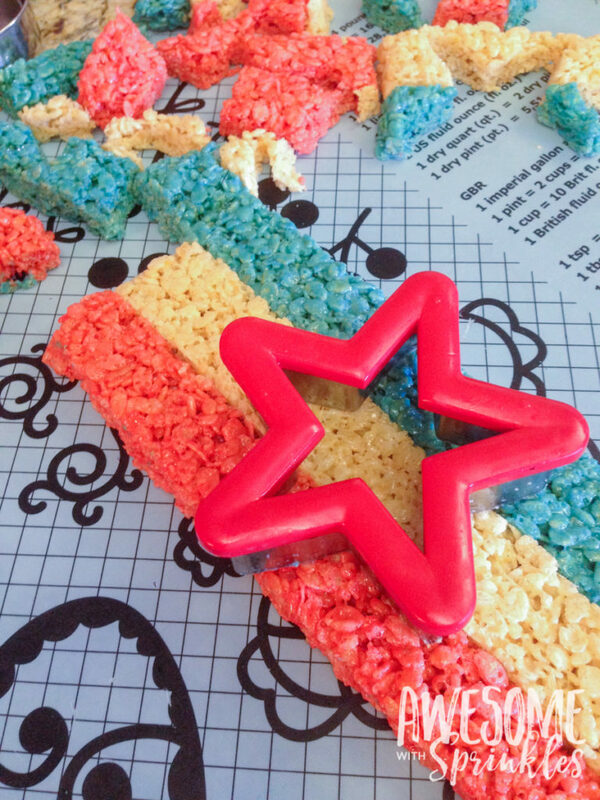 Cut out shapes using a star cookie cutter. We smooshed all of the excess pieces back together and rolled them into little balls. They sort of looked like red, white and blue tie-dye! 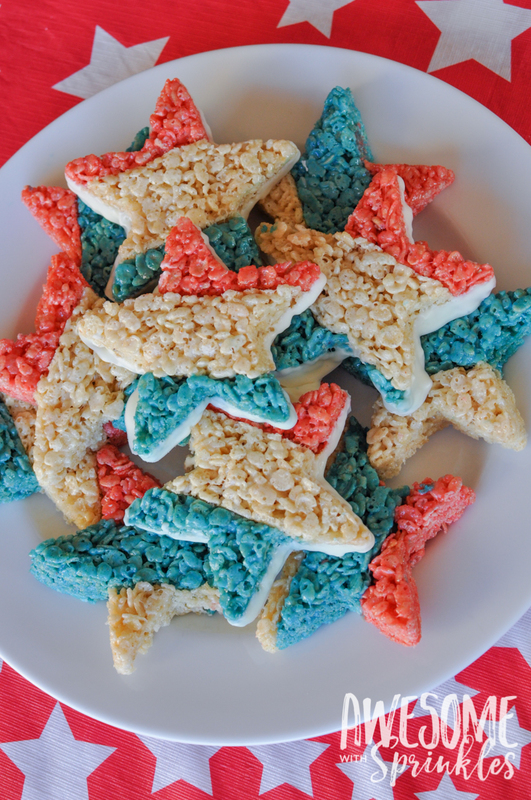 Next dip your star crispies in chocolate! This step is optional, but it does fancy the treats up and also helps the layers stick together a little bit better. Melt the white chocolate according to the package directions until completely melted and smooth. Transfer to a wide shallow bowl (big enough for your stars to fit in). Dip each cutout "face up" into the chocolate just enough to cover just the bottom half of the cutout. 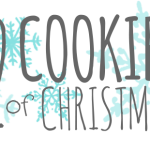 Place on a tray or cookie sheet covered in wax paper to cool and harden until chocolate is set and semi-hard.